Why Restaurants Need A POS System? Gone are the days of the classic store with a vintage cash register and the ledger where you can write down your tab when you’re short a few cents. Actually, you don’t even have to go that far back—the digital cash registers of just a few years ago are a far cry from today’s point of sale (POS) systems. One reason that TouchBistro is the top grossing food and drink app in more than 37 countries is that it was built by food service workers for food service workers. They know what works for them and what doesn’t. TouchBistro can stay humming online even when you go offline and with an easy-to-use, intuitive interface, it shouldn’t take long at all to get all your staff up to speed using the system. The cloud reporting analytics are very handy for managing a restaurant, in that they give you access to to all types of information about inventory and labor, to help you find where and how you can cut your costs. If you’re looking for software integrations, there are dozens of food service apps that you can integrate with Toast, one of the most affordable, easy to use POS systems available today. The system has an intuitive, drag-and-drop interface that any employee should be able to master, and if you ever have any issues, the company has responsive and effective customer service options. You can also make changes easily on the fly with the “quick edits” feature. And if you add an extra $50/month, the system will run integrated online ordering, so that customers can place orders with your company online and buy gift cards from your business. One of the biggest names in the industry, Revel can work wonders for major restaurants and even the smallest taco truck or caterer. The company has 2 main levels, Revel, which is meant for major businesses, and Revel Food Truck POS, which is specifically designed for food trucks. When working with Revel, you can use the “insights” feature to access real-time data at any moment in order to get an idea of how your company is doing on sales, inventory, manpower, and more. In addition, the company can integrate with your social media accounts in order to track your promotions and word-of-mouth efforts to another level. Lightspeed is a highly-effective POS system that uses extensive data to provide you powerful insight about your business. You can easily—and remotely—create floor plans for your restaurant and manage your staff and sales, and edit your menus. With Lightspeed you can access extensive inventory management down to the smallest sales item or ingredient, and also keep track of vendors, suppliers, and shipments of all types. You can also make use of a wide range of customer relations management tools, backed up by the data that the system makes use of. Also, if you’d like to run customer rewards programs or outreach programs, you can integrate with MailChimp and MailSync, in addition to a wide variety of business software programs. Best POS System is a Clover reseller. Clover is an all-in-one business management tool that can really help you run your restaurant. The system is very easy to set up and you shouldn’t need long to get your staff up to speed using it. Once you’re up and running, you can make use of extensive reporting and insights that can show you all types of information about your sales and what your business—and your competitors—are doing. You can also get great insights about your workforce, inventory, and customers. The company also allows you to integrate with more than 200 software apps, so you can build the platform that’s just right for your specifications. The POS systems of today combine state-of-the-art digital features and utilize extensive data to help businesses work faster than ever. Call them “smart registers” if you like, what these platforms do is allow you to process transactions instantly—from a central register or a mobile device—and also monitor your inventory, sales, and labor, to name just a few “smart” features. 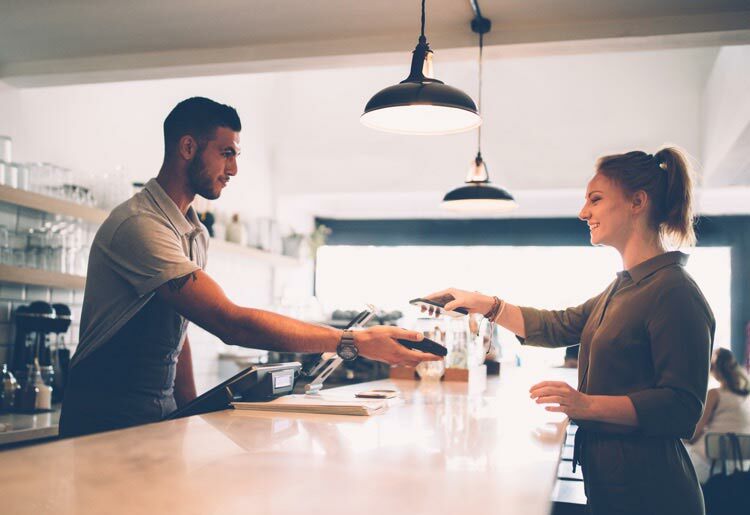 First things first, a POS system will help your restaurant process bills quicker and more efficiently, and will do so while also making sure that you and your clients’ details and data are kept secure at all times. This can also be done directly from a mobile device, meaning that if your work takes you far from the kitchen—say, out at a catered event—you can use a mobile device that can make instant transactions. Much like with retail POS systems, these platforms are mobile and can be used by staff throughout the restaurant. This means that the waitstaff can head out on the floor and take and place orders, without having to head back to the kitchen. They don’t have to worry about memorizing orders or reading them off a scribbled pad. Next up is the data. POS systems crunch all types of numbers about your business, ranging from which appetizers are selling best—and when—to which tables tend to have higher sales, and which members of your waitstaff just can’t find a way to upsell dessert. The data can also tell you how you’re doing on your inventory, which supplies you’re buying too much of, and which you need to stock up on right away. This can be a boon when it comes to cutting down your food costs. And when it comes to your staff, there are all types of features on POS systems to help you manage your staff, including shifts, holidays, and sick days. You can also use a POS system to handle all types of customer outreach. This can include everything from special sales campaigns and rewards, to coupons and invites to restaurant events. 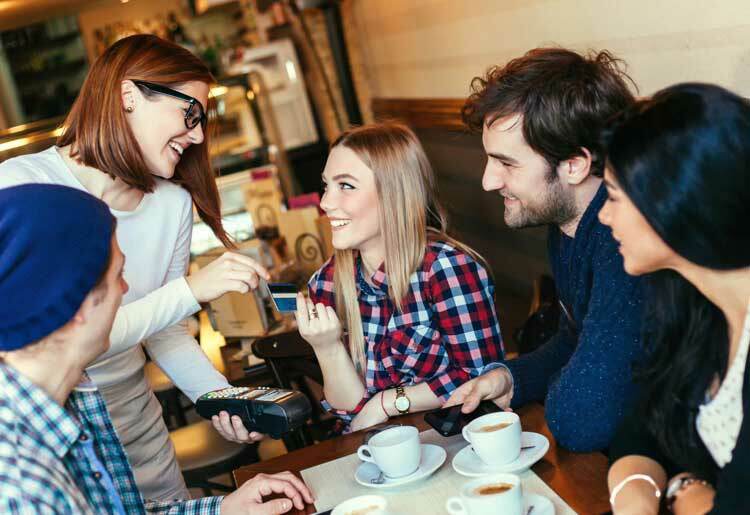 Your POS can keep these events organized and help you take the steps you need to maximize word of mouth and your connection to your customers. A POS can also be a lifesaver at the front of the house, helping your hosts seat and manage tables, and juggle reservations no matter how busy you get. Anybody who has worked in food service knows that it’s fast-paced. Things can change in a flash and sometimes it can seem like if something can go wrong, it will go wrong. When looking for a POS system, consider the ways it can simplify things, allowing you to make changes in an instant to adapt to all circumstances. 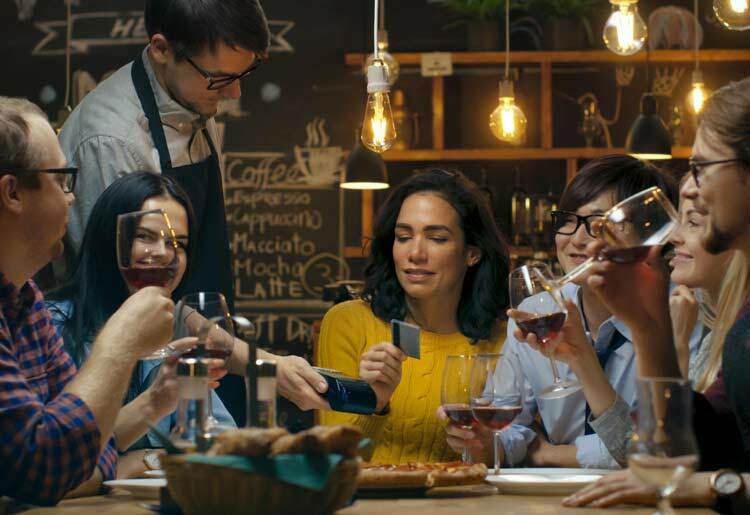 Credit card transactions and bookkeeping: These platforms can instantly split a check for multiple diners and allow you to make secure transactions in a flash no matter where you are inside—or far from—the business. A POS system makes your waitstaff more agile, efficient, and saves them some of the headaches that make waiting tables one of the more stressful jobs out there. These transactions will be instant and secure, allowing you to keep things well organized—and safe. Inventory management: With a POS you can track your company inventory at all times down to the smallest denominator. Being that food costs can make or break a business, this can really give you a boost keeping things under budget. Remote management: You’re not always going to be inside your restaurant—including when things get hectic, so you’ll need a POS system that can stay online and in charge, no matter where you are. In addition, most systems can still make transactions even when you go offline, so if you and your food cart are out working a festival and the WiFi is spotty, you should be fine. Payroll/workforce management: POS data can give you great insight on employee productivity; for instance, if you are a bar owner you can tell which bartender sells the most craft cocktails and which members of your waitstaff are doing the best job selling the daily special. In addition, a POS can help organize scheduling, sick days, and vacation days, as well as payroll and pay stubs. This is especially handy when tax season rolls around. Third party integrations: Most POS systems can integrate with a variety of Ecommerce and bookkeeping software. These can help you plan and carry out special customer discounts and award programs, and run an online store, just to name a couple. No 2 restaurants are exactly the same, and what works for you might not be the right recipe for somebody else. Before ordering a POS system, take the time to consider what type of restaurant you’re running and what your needs are. Are you a major, big ticket restaurant or a humble pizza restaurant? Will most of your business be mobile, out in the field (like with a food trailer) or is your main money-maker an in-house dinner service? If you’re a small volume eatery you may want to look for a POS that’s better suited for small businesses, or ones where the emphasis is on mobile capabilities. If you’re a bigger restaurant it's probably more wise to look for a system that really puts a lot of focus on its desktop register, integrations, and sophisticated analytics. In addition, for a small business, having a system that is easy to operate and does not require an IT team is a must. This is also true when it comes to customer service. If you’re a small team, if things go bad you’re going to want to be able to get a hold of help quickly. You should also look at the credit card processing fees. Considering that most of your food sales will be by credit, a little difference here or there can really add up. Sometimes, your restaurant can feel like your baby. You’ve poured your heart and soul into it and you want everything to run just right. A top restaurant POS system can make a big difference in the everyday operations of your business and make it easier for you to turn your dreams into reality.